Staying with her granny in London, in The War Monkey, Tegan stumbles on a family mystery - a girl called Alice. Was she really killed by a bomb in WWII or is she still alive? 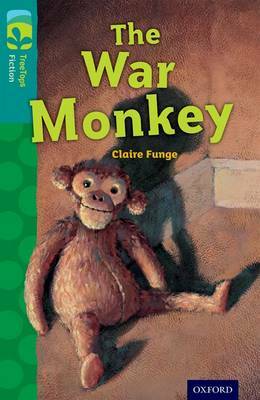 Everything depends on a child's toy called Monkey TreeTops Fiction contains a wide range of quality stories enabling children to explore and develop their own reading tastes and interests. It contains stories from a variety of genres including humour, sci-fi, adventure, mystery and historical fiction. These exciting stories are ideal for introducing children to a wide selection of authors and illustrators. There is huge variety to ensure every reader finds books they will enjoy and can read. Books contain inside cover notes to support children in their reading. Help with children's reading development also available at www.oxfordowl.co.uk. The books are finely levelled, making it easy to match every child to the right book.